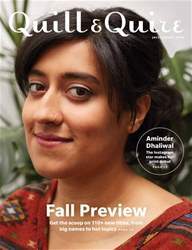 Alison Maxwell, who photographed Aminder Dhaliwal for this month’s cover, is a fine art and fashion photographer based out of Toronto. Her work focuses on the concepts of gender, sexuality, and technology through an experimental lens. Using tangible items, she distorts her images and invites an intimate experience between viewer and image. Samantha Edwards is a staff writer for Toronto’s Now Magazine and has written for Hazlitt, Fashion, The Globe and Mail, and House & Home. When she’s not writing about Canadian lit, music, feminism, or race issues, you’ll find her biking around the west end of Toronto. Her profile of author Claudia Dey appears on page 6.